Janine Wedel has done something that far too few anthropolologists do: She studied powerful people. Those who rule the world. 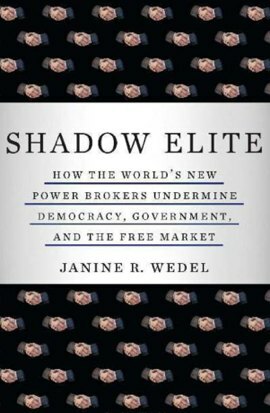 In her book “Shadow Elite“, she shows how a new system of power and influence has taken hold globally, one that undermines democracy, government, and the free market. Why went America to war against Iraq? More and more “government work” is performed by “shadow elites": consulting firms, companies, nongovernmental organizations, think tanks etc, rather small circles of powerful people (she calls them “flexians") who use their interlocking relationships to control public policy without public input. “Flexians” work often for private interests, academia and government at the same time. 4) relaxing rules at the interstices of official and private institutions, or adjusting accountability and rules that apply to one or more of their pelts from the safety of a seemingly non-aligned position. One of those flexians is the retired US general Barry McCaffrey, who has been simultaneously a commentator for the media, a consultant to the defence industry and professor. According to a 2008 exposé in the New York Times, he was one of several former military men who helped to shape public opinion on the Iraq war, while simultaneously having undisclosed ties to the Pentagon. Wedel’s book has received quite a lot of media attention since it was released earlier this year. It was book of the month at Huffington Post (where she has started writing a weekly column) and was also reviewed in mainstream media. She was interviewed both by BBC, Russia Today, MSNBC and Al Jazeera. (E)xamining eastern Europe up close–through its transformations away from communism over the last quarter century–has been excellent preparation for making sense of how a small group of power brokers helped engineer the invasion of Iraq, and more broadly, how a new system of power and influence has taken hold globally, one that, as I write in my book Shadow Elite, undermines democracy, government, and the free market. In communist Poland, the necessity of getting around the state-controlled system created a society whose lifeblood–just beneath the surface–was vital information, circulated only among friends and trusted colleagues, information that was not publicly available. Under-the-radar dealings that often played on the margins of legality - this was the norm, not the exception. I began to recognize a familiar (to me) architecture of power and influence. I started to follow the networks and overlapping connections in government, foundations, think tanks, and business of a tiny set of neoconservatives - just a dozen or so players I call the “Neocon core". The playbook of the Neocon core seemed to come straight from that of the top players of transitional eastern Europe. In both cases, players who already knew each other set up a host of organizations–organizations that seemed more like an extended family franchise than think tank, populated by the same set of individuals. (…) And despite a new administration in Washington, not to mention the damage done to their credibility since the Iraq invasion, the Neocon core lives on, because networks like it are self-propelling, multipurpose, and enduring. And she adds that as a social anthropologist, her “focus is not on whether the U.S. should have invaded Iraq, but rather how that decision was made, who made it, and what mechanisms of power and influence were used to make it". I have concluded that an ethnographic focus is indispensable to sorting out power and influence amid transforming federal governance in the United States, not only under change-of-system conditions such as those found in transitional eastern Europe. The ethnographic sensibility that enabled scholars of communist and post-communist societies to deal with the complexity, ambiguity and messiness of political and policy processes is ideally suited to examine the interactions between public policy and private interests and the mixing of state, nongovernmental, and business forms that are increasingly preva- lent in the United States and around the world. By focusing on players and their networks as drivers of governing and policy decisions, these ethnographers have laid the groundwork for badly needed critiques of social science categories such as “state” versus “private,” “top-down versus bottom-up,” and “centralized” versus “decentralized.” They have provided a basis for reexamining conventional models that guide so much thinking about politics, policy and power, and yet obfuscate, rather than illuminate, the real system of power and influence. It is popular to lament about the lack of public anthropology, but anthropologists have been highly visible in matters regarding global financial and power issues, see earlier posts Anthropologist Explores Wall Street Culture, Financial crisis: Anthropologists lead mass demonstration against G20 summit and Used anthropology to predict the financial crisis. Studies on elites are still not as common as studies on marginalized people, though. This is not only true for anthropology. I have to think of a series of great programs at BBC Thinking aloud about white collar crime - a rather neglected topic among sociologists and criminologists as well. Thank you Lorenz, this is fascinating. Many thanks for sharing this Lorenz. I have seen this being talked about by independent journalists here in Canada, but none mentioned that the author is an anthropologist. I hope to read the book soon. We are seeing many more anthropologists now tackling these issues, which is a really good sign. Yes, it’s a really good sign! Seems to be a facinating book. I remember several reviews that mentioned the anthropological perspective as something special, providing fresh perspectives. Excellent post, Lorenz. Will have to get the book, as these are big claims to make in such a runaway world as ours. Thank you Lorenz for this informative amazing post. A great topic. Fabiulous peace, i realy appriciate your labour..good wishes from Pakistan.